DHAKA, Bangladesh — Political turmoil and violent nationwide strikes regularly disrupted life in Bangladesh last year. But on a hot night in Dhaka, the capital, hundreds of people crowded into Dhaka Art Center for the opening of an exhibition of paintings by Rafiqun Nabi, an esteemed Bangladeshi artist famed for his newspaper cartoons. Children with parents, young men, couples, elderly visitors and entire families crowded the center and spilled into its brick courtyard in Dhanmondi, a neighborhood known as Dhaka’s thriving arts hub. Art lovers posed for photos next to an expansive painting featuring a jumble of geometric, blue-skinned men playing cards, blowing a flute and napping in the lee of a wooden boat. Boats and rivers are ubiquitous in Bangladesh, a river delta country between India and Myanmar, and were common motifs in Mr. Nabi’s paintings. So were lively street scenes, such as a family of three on a bicycle. Dhaka Art Center shows work by new artists, too, such as drawings by a young artist named Arham ul-Huq Chowdhury. The compact works shown a week after Mr. Nabi’s exhibition creatively used calligraphy to illustrate Bengali proverbs, like one of a cat rendered in coils of elongated Bengali letters. Bangladesh lays claim to a legacy of Bengali arts and culture shared by the neighboring Indian state of West Bengal, the birthplace of Rabindranath Tagore, the poet and Nobel laureate who wrote the national anthems of both India and Bangladesh. A contemporary arts scene began to grow in Bangladesh 20 years after a bloody war of independence separated the country from Pakistan in 1971. Since the 1990s, more artists have graduated from the country’s arts academies and universities, and new art venues have sprouted up. Now art openings happen weekly in Dhaka’s galleries, clustered mostly in Dhanmondi — though getting to them is a challenge in a city of seven million that is choked with traffic. In spite of the momentum, artists and patrons are still trying to push contemporary art beyond the country’s traditional notions. Some also strive to create an identity apart from grim scenes too easily associated with Bangladesh: cyclones, violent political protests, and bleak factories exemplified by the deadly collapse last year of the Rana Plaza building. 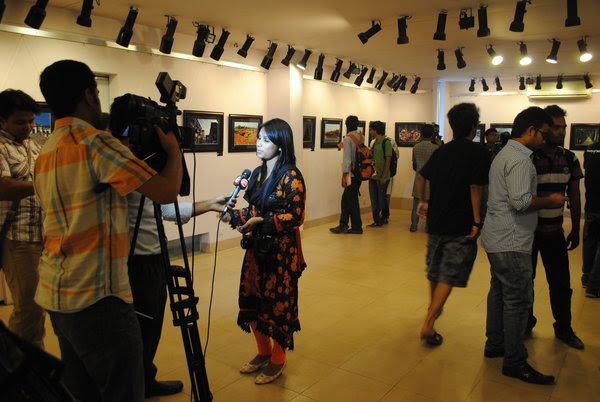 Founded in 1986, the Bengal Foundation was one of the first private arts institutions in Dhaka. Today it hosts exhibitions, concerts and other cultural events at the Bengal Gallery of Fine Arts in Dhanmondi, as well as the sleek new Bengal Art Lounge in Gulshan, the diplomatic enclave. The business magnate Abul Khair Litu started the foundation out of personal interest in the arts, and “the vision of projecting a culturally rich Bangladesh, rising above clichéd portraiture of a country steeped in flood and famine,” as he wrote in a 2011 book by the Bangladeshi photographer Shahidul Alam. Mr. Alam founded Drik, a photography agency and archive, in 1989 to use photography as a tool for social justice and to show Bangladesh in a different light. Mr. Alam’s photographs have appeared in the Museum of Modern Art in New York, the Pompidou Center in Paris and other museums around the world. After earning a doctorate in chemistry from the University of London — a useful degree for mixing darkroom chemicals, he noted — Mr. Alam stumbled into photography while hitchhiking in the United States with a borrowed Nikon. He was hooked and returned to Bangladesh in 1984. Eventually he founded Drik in his parents’ home in Dhanmondi. Today, Drik’s three-story building houses the agency, archives, a book publisher, and multimedia initiatives, along with galleries. Drik put Bangladesh on the map for photography, as did Pathshala, the photography school nearby that Mr. Alam founded in 1998. Pathshala has trained hundreds of Bangladeshi photographers, including award-winning photojournalists. In spite of Drik’s prominence, Mr. Alam said that art in Bangladesh was associated primarily with painting. The Asian Art Biennale has been held at the Bangladesh Shilpakala Academy in Dhaka for 30 years, yet photographs are still not accepted into the art fair. Others agree that acceptance of contemporary art must be broadened and internationalized. The art collectors Rajeeb and Nadia Samdani started the annual Dhaka Art Summit in 2012 to showcase contemporary art by Bangladeshi and international artists with a more avant-garde bent. The second summit, this past February, attracted 250 artists from South Asia and international curators for three days of exhibits, talks and experimental films. The Samdanis, both in their 30s, hope the event becomes a platform for the region and brings Bangladeshi contemporary art onto the global stage. They started collecting art in 2008 and their ultramodern home in Gulshan looks part-gallery, part-nightclub, with striking contemporary art displayed throughout the house. In the lobby, a life-size sculpture of a corpse by the Pakistani artist Huma Mulji lies on the floor grotesquely clutching at the air. Ms. Mulji modeled the sculpture on bodies of the “disappeared” found dumped in rivers in Pakistan. Upstairs, an outsize rack displays dozens of shiny metallic bras made of razor blades by the Bangladeshi arztist Tayeba Begum Lipi. Ms. Lipi’s work of a bed frame constructed of razor blades was recently acquired by the Guggenheim Museum in New York. Ms. Lipi is part of the Britto Arts Trust, a group in Dhaka founded by Bangladeshi artists in 2002 as an incubator for experimental work like video and installation art that remains largely alien to the city’s traditional venues. “When we started, galleries didn’t give us space,” recalled Mahbubur Rahman, one of Britto’s six founders. Britto has gained ground since then. It hosts workshops every two years for local and international artists, and has a new arts space near Dhanmondi where Britto’s 11 members work and exhibit. In 2009, Britto also helped stage 1mile2, a display of films, public art and installations focusing on ecology over one square mile of Old Dhaka, the capital’s chaotic historic district. For one day, works by 40 artists spotlighted the environmental and urban degradation so prevalent in Old Dhaka. Works included a life-size replica of a traditional wooden boat made of empty plastic bottles that carried passengers onto the black, fetid waters of the Buriganga River, and a photo installation depicting Dhaka’s wild urban monkeys. Mr. Rahman said that 15,000 people had viewed the show in a single day, including laborers who work and live in Old Dhaka. “They didn’t understand what was going on, but they are very much curious and enjoying,” he said. Although pockets of contemporary art are thriving in Dhaka, challenges remain. Bangladesh’s fine arts academies and universities tend to neglect teaching the subject, and there is still more respect for older, traditional artists. “No one wants young people to get recognition,” lamented Mr. Samdani of Dhaka Art Summit. 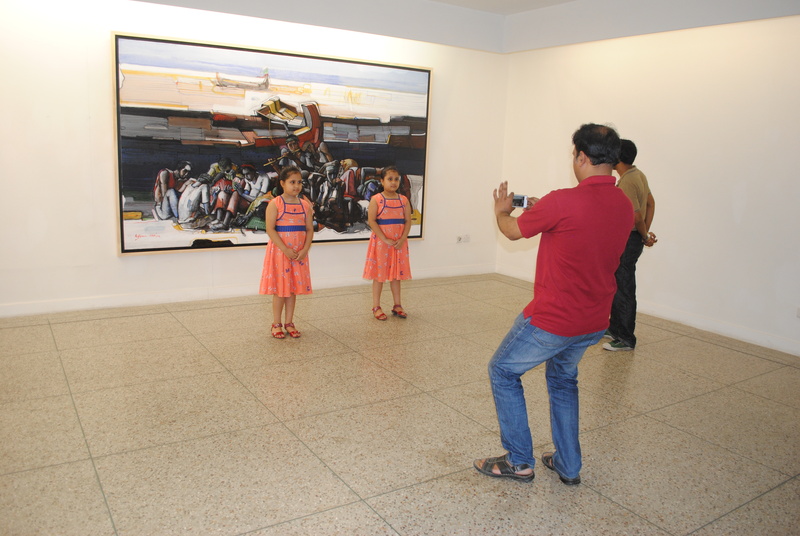 Those who attend art exhibitions in Dhaka seem oblivious to this infighting. Back at Mr. Nabi’s exhibition at Dhaka Art Center, a 35-year-old banker named Sazzad Islam admired the paintings. Mr. Islam studied accounting at university. His fondness for art has grown by visiting Dhaka’s galleries.